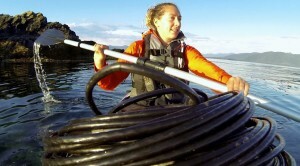 Dawn Barlow deploys a hand held hydrophone. 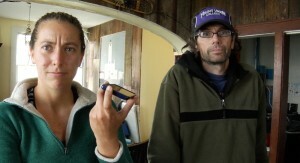 The day after Fred and I arrive at Five Finger Light, Dawn Barlow comes in by boat from Petersburg. 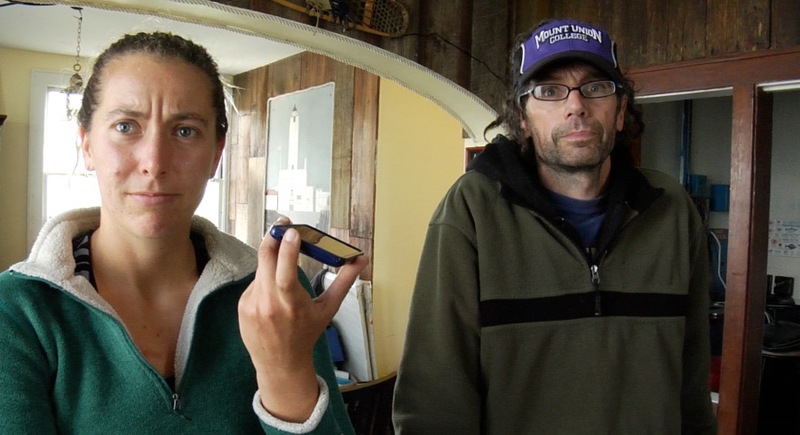 A senior at Pitzer College, Dawn will be analyzing the humpback recordings from our hydrophone for her senior thesis. She is a dedicated lighthouse volunteer as well and we are happy to have her with us. 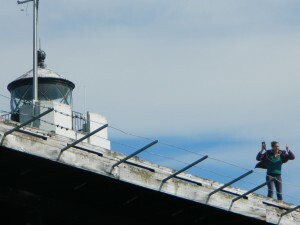 She will be staying with us at the lighthouse until late August. Dawn Barlow during 1st hydrophone Test. The day she arrives conditions are unusually welcoming- the sun is out, the weather is calm and there are whales swimming nearby. Wow! 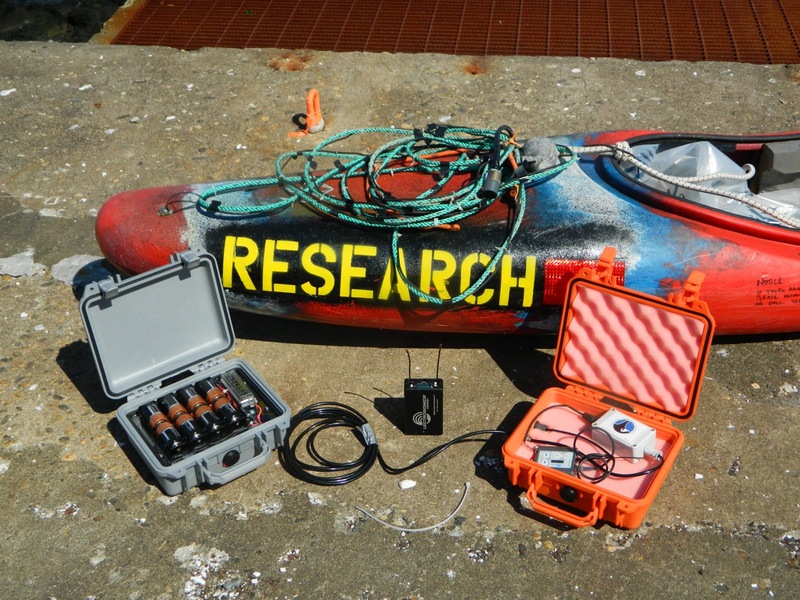 We are elated by this and decide to deploy our hydrophone for an initial test of the system. We never are able to get a feed from the hydrophone but it is good to do a practice deployment. 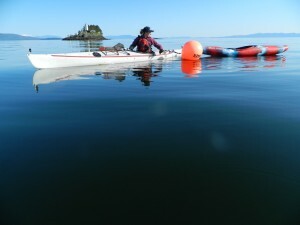 Paul Sharpe prepares hydrophone kayak. 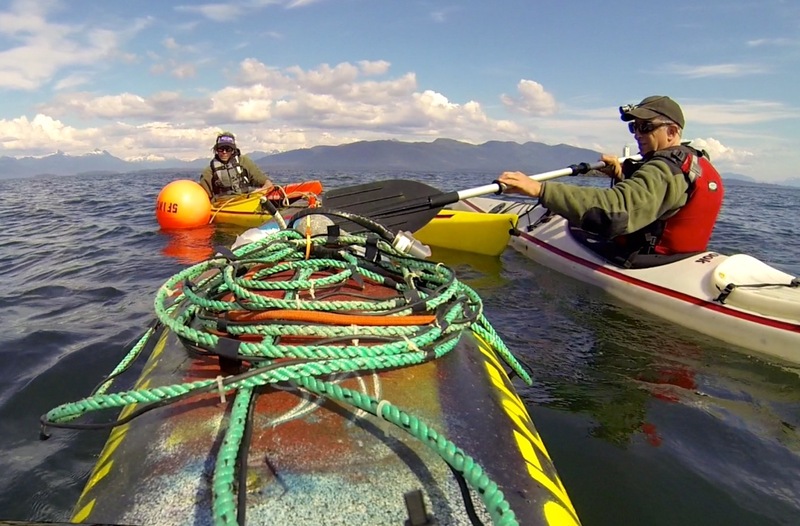 We spend the next week going over the hydrophone and optimizing the kayak to house the system. 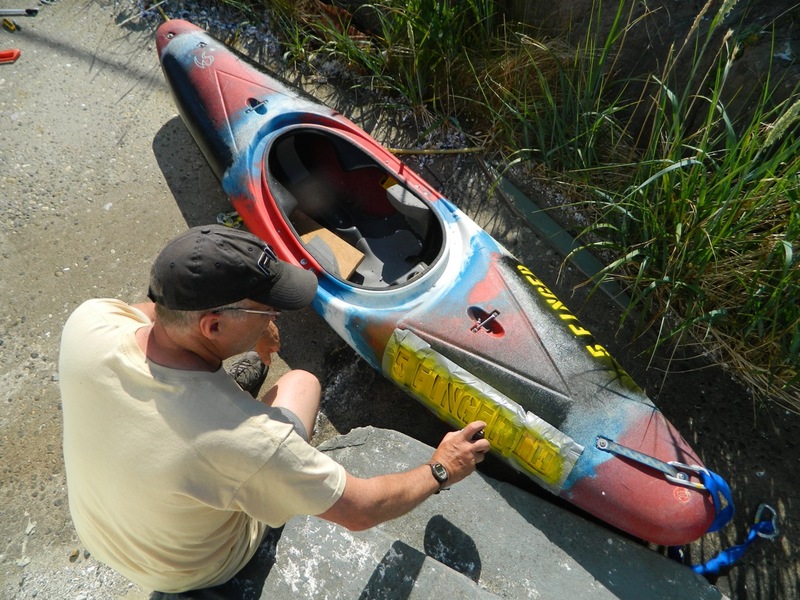 We identify our kayak with paint and stencils so that if it becomes detached from the buoy we have a chance of having it returned. The hydrophone line gets coupled with a lead line to give it support as it hangs in the water. We also attach a 5 lb lead weight to help the mic stay as deep in the water as possible in the strong currents. We fashion a spray skirt made out of an Alaska Airlines cargo bag and a bungee cord. In the photo on the left you can see the power supply in the gray box, housing 16 D cell batteries that the system designer thought would give us a month or two of run time. 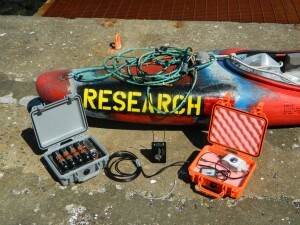 The orange box holds the hydrophone pre-amp and transmitter. Fred and Paul Sharpe deploy hydrophone. After another false start, we are ready to try our third deployment of the hydrophone. Fred and I kayak out from the lighthouse to our buoy while Dawn watches the signal on the receiver from the helicopter pad. It’s a bit of a paddle out to the buoy, towing the hydrophone kayak with the currents rushing by the island and some swell in the water. All systems seem to be functioning and we paddle back to the light to find a jubilant Dawn telling us she is picking up the signal from the underwater hydrophone. A little while later we are standing around inside, celebrating our success. Dawn is on the phone sharing with Michelle Fournet, a gal who is helping to guide Dawn on her project. Fred and I are listening to the hydrophone when we hear a strange sound coming over the speaker. It sounds like a whoosh. Then a few moments later it happens again, Dawn says over the phone that she hears something and Fred and I look at each other like, what the hell was that? A little bit goes by and then there is a very loud swooshing sound and suddenly the hydrophone goes completely dead. We run outside and see two animals surface not far from our hydrophone kayak which is now capsized. Here is the audio from the hydrophone being ripped out by it’s roots. Notable moments are at 24, 42, 57 and 1:13 seconds. We have determined it was a sea lion based on audio and visual evidence. Sea lions are notorious for messing with fishermen’s buoys and lines. Take a listen and see what animal you think it was. 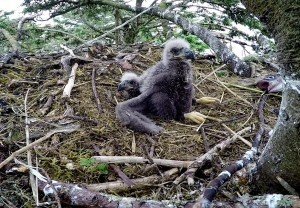 I’m not forgetting, I promised a peek into the eagles nest. Much more on that later. 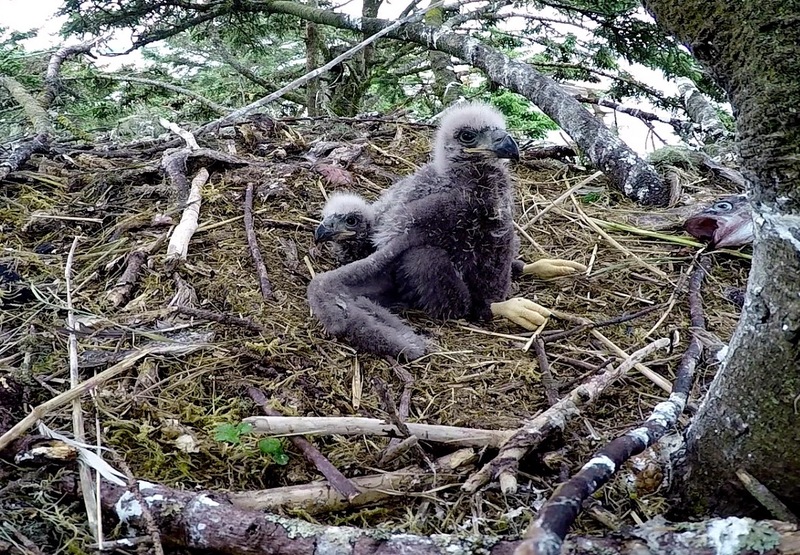 Two eaglets in their nest. Five Finger Lighthouse, back to one six. Previous Post:Time lapse video from the first few weeks.